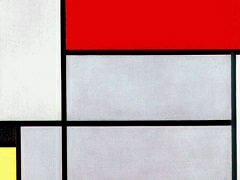 In June 1914 an exhibition of Mondrian's work was opened in The Hague, at the Walrecht Gallery. 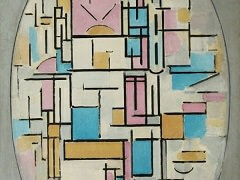 A few weeks later the artist was called back to the Netherlands from Paris, to the sickbed of his father. Then World War I broke out, making it impossible for him to return to France, although he insisted that he wanted to go. In the end, his family and friends were able to persuade him that any such attempt was useless. 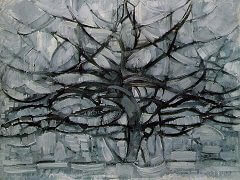 And so Mondrian was confined to the Netherlands for the duration of the war, cut off from the ambience of Paris which had inspired most of his work over the last few years. He soon returned to the themes he had been concerned with in Zealand and elsewhere before moving to Paris. 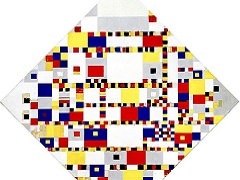 He did a series of drawings of the church at Domburg, conceived in accordance with the "abstract cubism" that he had developed in Paris. But in addition to this old theme he took up two particular new motifs, which were to occupy him for the first years of his enforced residence in the Netherlands: the sea, a subject that he had already handled in several works during his Zeeland period; and something related yet completely new - the theme of Pier and Ocean. 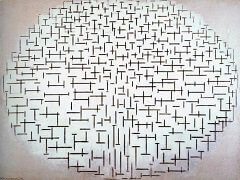 This title is perhaps too simple for the powerful series of paintings and drawings to which it is applied. What these works are actually about is the rhythm of the waves, breaking in a strictly circumscribed cadence against the structure built out at a right angle into the sea. 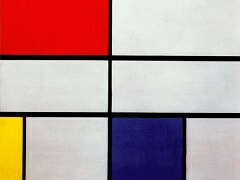 As can be seen, the view is from above, for Mondrian first sketched the subject looking down from the dunes. In the first drawings, in charcoal, sometimes heightened with India ink or tempera, the pier is still clearly recognizable. 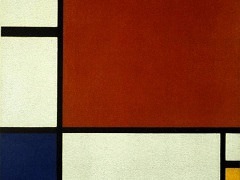 Composition No. 10: Pier and Ocean epitomizes all the previous stages of this composition. 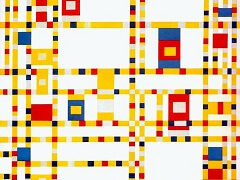 It straightens all the elements that in earlier versions were indicated by oblique or indistinct lines. 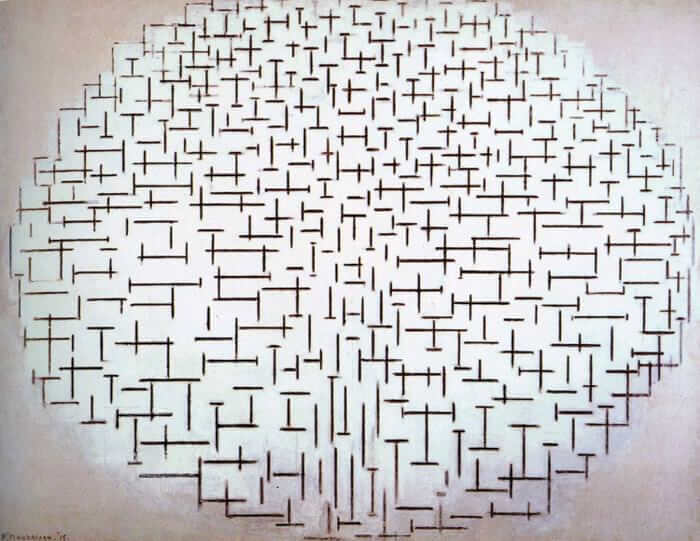 It reduces the rhythm of the waves and their breaking to a pure and simple pattern of lines, each precisely determinate in length and interval, like notes in a musical score. And yet this painting is remarkable precisely for the reason that this rhythmic abstraction from the unending movement of nature still proceeds visibly and demonstrably from an optical perception, even though it has been translated into an idiom in which only the rhythmic values count and all memory of the original subject matter has been lost.